You are here: Home / Featured News / Put Your Helmet On! You wear a helmet for a bunch of other things. Why not wear it for sailing? I’ll admit that when I first heard about helmets being introduced to sailing I sneered and said things like, “that will never happen” and “it won’t take off.” But over the past few years my views have taken a complete turn. First let’s talk about helmets. We wear helmets for so many sports and activities. You wear them when you ride a bicycle, when you play sports like football and ice hockey, and when you stand next to home plate as a batter. Why not wear one for all levels of sailing? Head trauma in sailing is one of the biggest dangers of the sport. Often times, an injury to the head results in a sailor being knocked unconscious and possibly drowning. The use of helmets cuts down on this possibility. We don’t have to drag out the facts, we know that helmets promote safety, but still many of us in the sailing world don’t use them. The best comparison story is the use of helmets while on the ski hill. In the mid to late nineties when I was learning to ski and later snowboard, not many people on the mountain wore helmets. You would often hear people say the lines such as, “they’ll never take off.” But nowadays, almost everyone on the mountain has a helmet, and it’s the people without helmets who are the random oddballs. On top of that, we don’t even think about it either. We just grab our helmet to give us that extra protection and peace of mind knowing it’s better to have it then not. This feeling is what I encountered on some of the Learn to Sail courses I ran this past year for a New Zealand sailing program. I had never taught learn to sail courses with the options of wearing helmets and part of me was thinking old thoughts such as the ones my generation encountered when starting sailing like, “you’ll remember to duck if you get a good smack by the boom,” but if anyone has ever taught learn to sail courses, they know that if you have a kid get a real good knock by the boom, he or she might never get into a boat again. The use of helmets gives an extra level of protection of course, but they also supply more confidence. This is the confidence knowing that if the boom does make contact with your head, it’s quite minor in compared to if you didn’t have the helmet on. Even the smallest of Optimist booms at 40mm diameter have the force do some real damage, and we all know the damage a larger keelboat boom can cause. 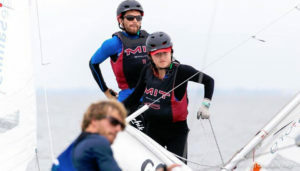 Sailors competing the America’s Cup all wear helmets, so do a lot of others in foiling boats classes, along with many high school and college sailing teams. The helmets are well designed and after a while sailors get used to them, they become just another part of the gear. I’ve been thinking of buying a Laser or maybe another single handed dinghy I could go out and train by myself in. The more I think of buying this boat, the more I think of also buying a helmet at the same time. Especially if you are training on your own, that helmet could save your life just as much as a life jacket. 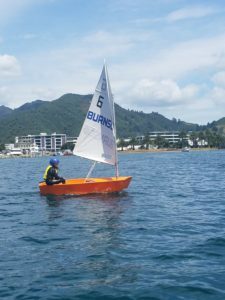 The days of when wearing a helmet on the mountain was “uncool” or “lame” are over, and those same mentalities for helmets while sailing are coming to an end. Helmets prevent fractured skulls. That’s why cyclists need them. Do they prevent concussions? I don’t believe they do. They certainly do not prevent concussions in football. I think it’s just as easy to get a concussion wearing a helmet than not wearing a helmet. Just because everyone is doing it, doesn’t necessarily mean it’s a good idea.